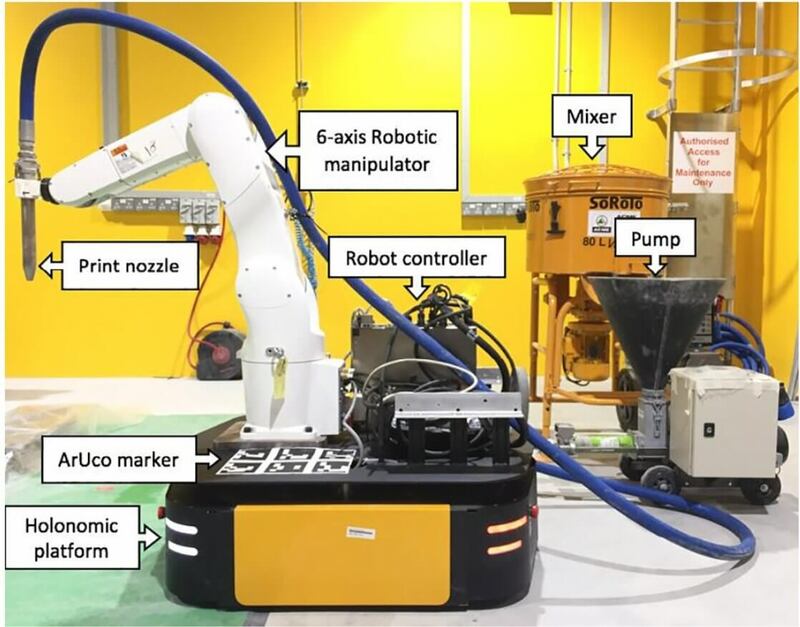 Researchers at the Nanyang Technological University in Singapore have tackled the problem of 3D printing large structures by thinking outside of the “box.” Their solution: Use robotic arms on mobile platforms to do the job. As a proof of concept the team has created a prototype that can print “a single-piece concrete structure [using] two mobile robots operating concurrently.” This feat is a first so far as they know. The obvious advantage to this method of 3D printing is that size doesn’t matter. Since the robots can move around, the area of an object is of little concern. As you can see in the video (top), the height of the printed material is limited by the reach of the robotic arms. However, this could be overcome with bots of an industrial scale, by the use of scaffolding, or other solutions. In fact, the team is already thinking of incorporating scissor lifts into the design. Another not-so-obvious advantage is that bigger print jobs can be sped up by using more bots. You may have noticed that once the arms moved into their positions, the bases remained stationary. This is due to a limitation the project lead Cuong Pham says they are trying to solve. At this time, trying to print while the bases are moving fouls up the precision of the job. “[Getting the robots to print while moving] requires even higher precision in the localization of the base [about 1mm] to ensure that the layers are appropriately positioned one above the other,” said Pham. The team imagines their devices being used in construction, especially in hard to reach or dangerous areas such as mines or underground caves. It also thinks that they could be useful in creating structures and even dwellings on the Moon or Mars — places where traditional construction equipment would be impractical. What is the worst that could happen? You wake up in the morning to find you have been put in prison. They have built a wall around your home. There was that robotic machine that could make domes in a few hours that could withstand weather decently and were large enough to house a small family if needed. Am I the only one who noticed they are misaligned from eachother? There's an obvious offset where the two connect. Am I the only one who noticed they are misaligned from each other? There's an obvious offset where the two connect. No and in fact, I thought they were making two independent pieces the whole time I watched (sound was off).